Mark Flagler has worked in the field of video production for 23 years. After graduating with a degree in communications and video production Mark launched himself into his career as a producer, director, cameraman and editor. With his passion for the outdoors and wildlife Mark took his first job as the lead-cameraman with Wolfsight Productions (North Carolina) where he co-produced a documentary on the Southeastern Red Wolf. To further his video production experience, he took a position with WWAY News Channel 3 (an ABC News Affiliate) as a cameraman and editor where he thrived on the fast paced environment and the thrill of capturing live shots for daily news broadcasts. Following his stint in news Mark took a position as cameraman and editor for TSG Productions in North Carolina where he shot, produced, directed, and edited local commercials and sporting events, county commissioner meetings, government programs and talk shows. Mark spent much of his free time traveling cross-country, hiking, and filming the outdoors, scenic landscapes, and wildlife in over 30 National Parks. He has leased stock footage to Discovery Channel (Animal Planet) and Endangered Species Productions, to name a few. In 2001, Mark hiked the 2,168-mile Appalachian Trail from Georgia to Maine. During the six-month hike, he plotted the documentary he would later produce about this world famous hiking trail. With his great variety of experiences Mark finally decided to branch out on his own. Hence Flagler Films was born. Mark is an avid outdoors person with experience in hiking and backpacking, rock climbing, mountaineering, canoeing, cycling, mountain biking, surfing, snowshoeing and skiing. He was a member of Portland Mountain Rescue where he assisted on above tree-line rescue missions in Oregon's Cascade Mountain Range. He also shot a rescue re-enactment for the Discovery Health Channel. In 2003, he returned to the Appalachian Trail to document the historic footpath and the thru hiker journey. The inspiring two-hour program titled Appalachian Impressions - Hiking the Appalachian Trail was completed in 2004. This award-winning documentary has been seen on 262 PBS stations across the US with over 930,000 households watching this documentary. The success of Appalachian Impressions has inspired Mark to produce more programs about long-distance hiking trails. After spending two years securing funds and sponsors, Mark returned to the backcountry in 2006 to capture the Continental Divide Trail (CDT). He spent over 7 months hiking and filming parts of the 3,100-mile CDT. The two-hour program, titled Walking the Great Divide - A Journey Along the Continental Divide Trail, takes you from Mexico to Canada along the backbone of America. The two-hour program was completed in January 2008 and has been broadcast on 428 PBS stations across the U.S. since 2009. Over 1,000,000 households have tuned in to watch this documentary. Appalachian Impressions and Walking the Great Divide have earned "primetime" rating honors and the two-disc DVD versions of both documentaries continue to be a success and are sold throughout North America in stores and online. In 2007, Mark teamed up with his sister Laura Crowell and Ready...Set...Grow... Entertainment to produce a TV program and interactive children's DVD titled Hard Workin' Wheels – In Your Neighborhood. This 30-minute educational program was completed in 2008 and introduces children to the sights and sounds of fire trucks, dump trucks and tractors hard at work in your neighborhood. This program is also broadcast on select PBS stations in the US. Mark moved his operations across the Atlantic to the country of Ireland where he, his wife and daughter live just outside Dublin in Celbridge, Co. Kildare. Mark and Flagler Films have continued to stay busy working on an array of video projects. 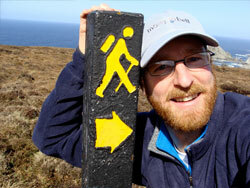 In 2008, Mark was hired to direct and film a program for RTE's Capital D. Flagler Films has produced many promotional videos for: The International Appalachian Trail – Newfoundland & Labrador Chapter, Derrinstown Stud, Volunteer Ireland, Dublin & Wicklow Mountain Rescue Team and Universal Trace. In 2009, Mark was hired by Adsell Productions as a studio manager, cameraman and editor. During the 10-month period Mark successfully produced promotional videos and DVDs for Darley Flying Start (Kildangan Stud), Ballylinch Stud, and Derrinstown Stud. Mark also worked on projects for French television channel Equidia and Setanta Sports. In 2010, Mark Flagler became an Apple Certified Pro in Final Cut Pro 7 and Motion 4. Later that year Flagler Films opened its online Outdoor Store where people can purchase a select variety of Flagler Films DVDs, books and maps. More products will be introduced each year. Most recently Flagler Films has produced a video about the International Appalachian Trail in Ireland for Failte Ireland and the National Trails Office of the Irish Sports Council. Coast Alive and The Interreg North Sea Region Programme contracted Flagler Films to develop, create and produce a video animation about their invaluable Toolkit document and Vest-Agder and Audnedal County Councils in Southern Norway hired Flagler Films to produce a video about The Child Wanderer Path. Over the years Mark has also been invited and contracted to deliver a variety of presentations about the outdoors throughout America, Ireland, The Netherlands and Norway. Flagler Films is recognized as an industry leader in walking and hiking projects. Flagler Films television statistics, quality of work and impressed clients speak for themselves. Flagler Films is currently in discussions regarding the production of a television and DVD series about the International Appalachian Trail that now travels throughout North America and Europe. If this project goes ahead, while it will take several years to complete, Mark also hopes to be available to produce other walking promotional videos each spring and summer.